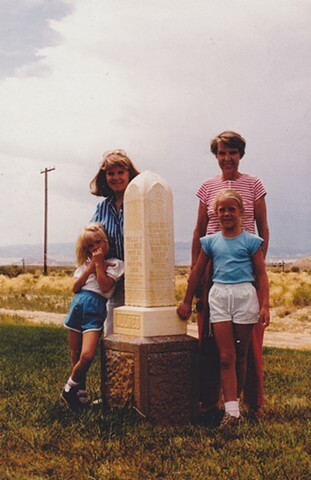 The artist, lower left, with her mom, grandma, and sister in central Utah in the 1980s, at the grave marker of her great great great grandfather, early Mormon pioneer Wiley Payne Allred. I spend my Sundays not at church but in the studio. I choose to live a secular life, but I am always mindfully connected to my non-secular past. I was raised a Mormon, a quintessentially American religion birthed by the fever-pitched revivals of the early 1800s, shunned for its peculiarities for over century, and finally praised (by some, at least) for its ability to breed a uniquely wholesome and hardworking type of family-centered citizen. My ancestors came to America to practice their new religion, where they and their fellow Mormons disrupted local settlements and were chased west across the country to the relative safety of the Rocky Mountains and beyond. The version of the story I heard growing up included angels, visions, and great miracles. As a child my mind was flooded with images of brave struggles against a barren landscape and my heart was bursting with pride. But much has changed since then. Leaving my religion almost two decades ago has given me a deeper appreciation for it despite its dubious past, often equally dubious present, and my objections to most of its doctrine. Its richness and complexity comes from exactly that which I was protected from – the parts that make the actors in the drama human rather than holy. Working against human nature to perfect oneself is a basic tenet in Mormon theology, one that is difficult to let go of once indoctrinated. In my art I work through this struggle, mourning the lost magic of childhood tales while seeking beauty in the complicated realities of adulthood. Formally I am interested in making images that reflect a mixture of traditional religious imagery and children’s storybook pictures. Both forms of art teach "correct" moral and social behavior; both forms also leave room for the subversion of that subtle didactic morality. The long-standing traditions of this visual cultural conditioning (and it’s undermining by artists) ground my work in history, while allowing me to play with these ideas in contemporary ways.